The countdown timer is great for ecommerce websites looking to create a sense of urgency with sales. The Countdown Timer Element in Shogun is a great method of creating a sense of urgency for your customers and driving sales. To get started with the Countdown Timer Element, simply drag one onto your page. You can set the element to start a countdown from the time the visitor enters the page. This can be helpful for creating a sense of urgency on a product page. You can also set the Countdown Timer Element to countdown to a certain date. This can be helpful for counting down the time till the end of a sale. If you want to customise the labels of the Countdown Timer Element, you can do so by clicking on 'Time Labels'. 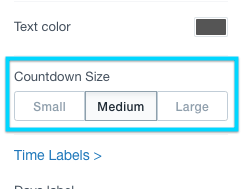 There are three size options for the Countdown Timer Element: small, medium or large. You can change these in the settings of the element.